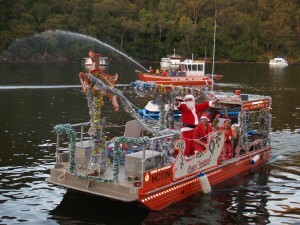 What a magical way to spend the Christmas holidays with the family, right on the river at Berowra Waters! The river community organise fund raisers throughout the year in order to subsidise Santa bags for the children on the river. Santa comes along on a beautifully decorated boat, lit up by lots of lights and Christmas music and pulls into the river pontoons to deliver each child’s Santa bag. These Santa bags are chock full of great gifts and keep the children entertained for hours, even days! So try something different at Christmas time, book your accommodation Berowra Waters for the whole family and enjoy a festive Christmas on the river. The Lodge at Berowra Waters can accommodate 3 couples (6 adults) or 2 couples (4 adults) and 2 children. For further people please contact us to discuss your requirements.